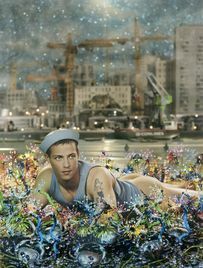 Pierre et Gilles began working together in 1976, and their distinctive style has enjoyed great success ever. Their photographs are all hand-painted, making each one unique. They have established a distinctive visual world drawing on popular imagery, mythology, magic, slapstick, religion and eroticism. The two artists explore and reinvent popular images, crossing frontiers and fuelling a collective imagination that reaches well beyond the confines of contemporary art. Their personal pantheon is peopled by stars from the worlds of pop, rock, fashion, art, cinema and the clubbing scene, but also by unknown individuals they have met over the years. 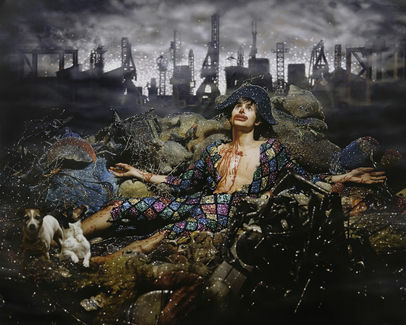 The idea for Wonderful Town came about when Pierre et Gilles got back from a journey to Japan. A country where the towns and cities have lost their humanity and, as a result, city-dwellers feel the need to invent dreams, fantasies and acts of folly to escape from the harshness of reality. In Wonderful Town, people’s dreams invade the city which is no longer a utopia and has instead morphed into a strange kind of reality, symbolised by cranes and worksite machinery, factories, cubic buildings, scraps of cars and heaps of rubbish; all the people here have to invent their own worlds where everything becomes possible. A few of the characters from the exclusive world of Wonderful Town within which Pierre et Gilles have created almost all of their works for the last three years have already been unveiled to us as part of major exhibitions held at museums or institutions, giving us a first glimpse of the many different facets of this world. The sailor in Full Moon (2007) and Bare Capture (2008) as well as the new artists’ racy self-portrait in Toys (2007) first appeared amongst others in the personal exhibition devoted to Pierre et Gilles as part of the new Prospect 1 New Orleans biennial. The works Toutes les Femmes ont un Secret and De l’autre cote de l’amour (2008), with the iconic singer Sylvie Vartan as the model, were created at the occasion of the Pierre et Gilles retrospective at the Sofia Art Gallery museum in Bulgaria – her native country – and are also illustrations for her last record CD cover. All photos © Pierre et Gilles. Courtesy Galerie Jerome de Noirmont. Gallery hours: Monday to Saturday / 11am to 7pm (except on bank holidays). Admission free.